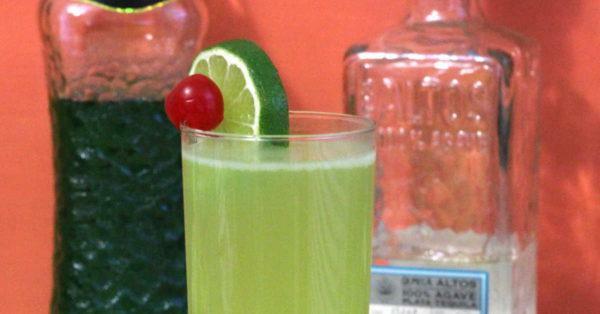 The Shady Lady drink is a tequila cocktail that features Midori and white grapefruit juice. Tequila drinks are among my favorites. Maybe it’s because tequila gives me such an easy-going good feeling. Maybe it’s the way tequila blends with so many flavors so smoothly. So many tequila cocktails involve lime, lemon or orange. Grapefruit is a little more unusual, although not unique. If you like the combination, check out the Evergreen Cocktail, the White Lizard and the Durango. One of the nice things about this drink is how easy it is to pour. There’s no shaking involved – just build the ingredients in a glass, and stir. If you’re thinking this sounds like a very tart drink, it’s not. The Midori mellows that right out. This drink is perfect for hot summer days. The vitamins in the grapefruit juice help to counter the dehydrating effects of the alcohol. And that means you can enjoy without becoming uncomfortable. That also makes it great for evenings out, especially if you’re going to be dancing. This drink actually works as a brunch cocktail. It’s a bit on the strong side, but with four ounces of fruit juice, it fills the bill. I was surprised to discover that cinnamon pairs very well with the honeydew and grapefruit flavor. For brunch, try enjoying this drink with cinnamon french toast, cinnamon rolls, or any pastry lightly sprinkled with cinnamon sugar. But you can enjoy it with any meal of the day. Because the Midori gives it a honeydew flavor, it pairs well with cantaloupe, like in this grilled shrimp with cantaloupe lime salsa from Steamy Kitchen. For a lighter snack that’s also cool and refreshing, try Cantaloupe Melon Sorbet from The Kitchen McCabe. Just build the ingredients in a highball glass, and garnish with lime and a cherry. Easy-peasy!